Google is finally making huge moves in the gaming industry. In 2018, the tech giant unveiled what they called “Project Stream”, a game streaming platform that gave players the ability to stream AAA games at high quality with nothing else but a Chrome browser and fast internet connection. Last year, The Information reported that the company was developing some sort of hardware component to accompany their streaming software. While they were unsure of what the hardware would look like, they seemed to think that Google could have been developing their very own gaming console. Earlier today, Google hit the stage at GDC 2019 to talk about what it called their “vision for the future of gaming.” Here’s what they unveiled. The initiative is meant to intertwine game creation, game sharing and of course gaming itself, by utilizing YouTube as a sort of gaming hub. If you see a game you like on the site, simply click the video’s “Play Now” button, and within as little as 5 seconds, you’ll be able to play the game. No install, no download, and no patches. “Our platform vision for Stadia is to reduce the friction between getting excited about a game and playing a game. On Stadia, you just need to click on a YouTube video or link, and you can be playing your game instantly,” said Google’s Phil Harrison. At launch, Stadia will be playable on desktops, laptops, TV, tablets, and phones. During the presentation, Google once again used Ubisoft’s Assassin’s Creed: Odyssey to show off Stadia. Presenters seamlessly launched the game on a Google Pixelbook and proceeded to exit and relaunch the game on a Pixel phone, PC, Pixel Slate, and even a Chromecast. Of course, that wasn’t all that Google unveiled. Google also gave fans their first look at the Stadia Controller, which was described as the “gateway to the best of Stadia.” Phil Harrison continued by explaining that the controller gave players access to the full Stadia experience, regardless of which platform they choose to play on. 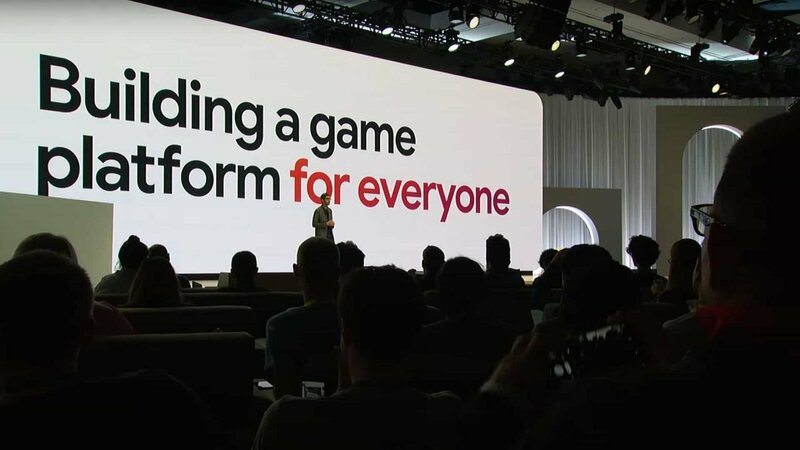 Google engineer Madj Pakar then took the stage to show how the Stadia platform could expand in the coming years. According to Pakar, Google data centers will be able to deliver 8K resolution at 120 FPS, depending on your internet speed, off course. He also let the audience know that the Stadia ecosystem would allow gamers to save and share gameplay footage at 4K 60FPS, directly to YouTube. Pakar also boasted about the pure speed of Stadia, stating that the software was capable of producing better performance than the PS4 Pro and Xbox One X combined. The project an impressive collection of partners as well, which included AMD, Unity, Havok, Vulkan, the Cryengine, the Unreal Engine, and more.